A few years ago, I got to see a 1:1500 scale model of London at the Building Centre there. It is a large scale model of the heart of the city in three dimensions, with representations of most buildings, landmarks, parks, the Thames, and the (at the time yet to be built) Olympic Park. And it is as nothing compared to The Panorama at the Queens Museum of Art. The Panorama is the jewel in the crown of the collection of the Queens Museum of Art. Built by Robert Moses for the 1964 World’s Fair, in part as a celebration of the City’s municipal infrastructure, this 9,335 square foot architectural model includes every single building constructed before 1992 in all five boroughs; that is a total of 895,000 individual structures. The Panorama was built by a team of 100 people working for the great architectural model makers Raymond Lester Associates in the three years before the opening of the 1964 World’s Fair. In planning the model, Lester Associates referred to aerial photographs, insurance maps, and a range of other City material; the Panorama had to be accurate, indeed the initial contract demanded less than one percent margin of error between reality and the model. The Panorama was one of the most successful attractions at the ‘64 Fair with a daily average of 1,400 people taking advantage of its 9 minute simulated helicopter ride around the City. After the Fair the Panorama remained open to the public, its originally planned use as an urban planning tool seemingly forgotten. Until 1970 all of the changes in the City were accurately recreated in the model by Lester’s team. After 1970 very few changes were made until 1992, when again Lester Associates changed over 60,000 structures to bring it up-to-date. In the Spring of 2009 the Museum launched its Adopt-A-Building program with the installation of the Panorama’s newest addition, Citi Field, to continue for the ongoing care and maintenance of this beloved treasure. The Queens Museum of Art has a program giving you the opportunity to “purchase” NYC real estate on The Panorama of the City of New York for as low as $50. To learn how you can become involved click here. We hope that you will take time to enjoy the Panorama of the City of New York. The Panorama of the City of New York is sponsored by the New York City Department of Cultural Affairs and New York State Assembly members Mike Gianaris, Mark Weprin, Audrey Pheffer, Nettie Mayersohn and Ivan Lafayette, The New York Mets Foundation and the supporters of the Adopt-A-Building Program. View the winning pictures from our Gala 2011 Panorama Picture Contest! View pictures from our Gala 2011 Photo booth, May 12, 2011! Add your own pictures to our Panorama Flickr Group! 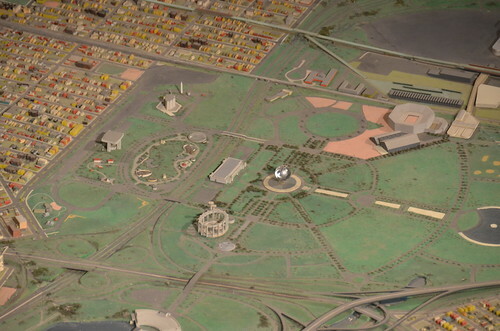 The best known permanent exhibition at the Queens Museum is the Panorama of the City of New York which was commissioned by Robert Moses for the 1964 World’s Fair. A celebration of the City’s municipal infrastructure, this 9,335-square-foot (867.2 m2) architectural model includes every single building constructed before 1992 in all five boroughs; that is a total of 895,000 individual structures. The Panorama was built by a team of 100 people working for the architectural model makers Raymond Lester Associates in the three years before the opening of the 1964 World’s Fair. The Panorama was one of the most successful attractions at the ’64 Fair with a daily average of 1,400 people taking advantage of its 9 minute simulated helicopter ride around the City. After the Fair the Panorama remained open to the public and until 1970 all of the changes in the City were accurately recreated in the model by Lester’s team. After 1970 very few changes were made until 1992, when again Lester Associates was hired to update the model to coincide with the re-opening of the museum. The model makers changed over 60,000 structures to bring it up-to-date. In March 2009 the museum announced the intention to update the panorama on an ongoing basis. To raise funds and draw public attention the museum will allow individuals and developers to have accurate models made of buildings newer than the 1992 update created and added in exchange for a donation. Accurate models of smaller apartment buildings and private homes, now represented by generic models, can also be added. The twin towers of the World Trade Center will be replaced when the new buildings are created, the museum has chosen to allow them to remain until construction is complete rather than representing an empty hole. The first new buildings to be added was the new Citi Field stadium of the New York Mets. The model of the old Shea Stadium will continue to be displayed elsewhere in the museum. The Panorama of the City of New York, the world's largest scale model of its time, was the creation of Robert Moses and Raymond Lester. 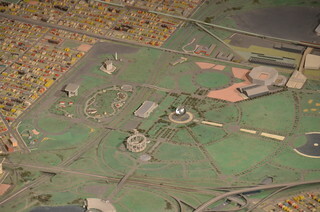 Presented in the New York City Pavilion as the city’s premiere exhibit at the 1964/65 New York World’s Fair, it was intended afterwards to serve as an urban planning tool. Visitors experienced the Panorama from a simulated “helicopter” ride that travelled around perimeter or from a glass-enclosed balcony on the second floor, while news commentator Lowell Thomas provided audio commentary on “The City of Opportunity.” One of the “helicopter” cars is now on view in the Museum’s permanent exhibition, A Panoramic View: A History of the New York City Building and Flushing Meadows Corona Park. Constructed at the Lester Associates workshop in Westchester, New York, the Panorama contains 273 separate sections, many of which are four-by-ten-foot rectangular panels. They are composed of Formica flakeboard topped with urethane foam slabs from which the typography was carved. Lester Associates’ staff consulted geological survey maps, aerial photographs, and books of City insurance maps, to accurately render the City’s streets, highways, parks, and buildings. Once the Panorama’s modules were completed at Lester Associates’ workshop, they were assembled on site in the New York City Building. It took more than 100 workers, three years to complete the model. Built on a sale of 1:1,200 (1 inch equals 100 feet), the Panorama occupies 9.335 square feet and accurately replicates New York City including all 320 square miles of its five boroughs and 771 miles of shoreline, as well as the built environment. It includes miniature cars, boats, and an airplane landing and taking off at LaGuardia Airport. The majority of the City’s buildings are presented by standardized model units made from wood and acrylic. Of more than 895,000 individual structures, 25,000 are custom-made to approximate landmarks such as skyscrapers, large factories, colleges, museums, and major churches. The amount of detail possible on most buildings is limited; at a scale of 1 inch to 100 feet, the model of the Empire State Building measures only 15 inches. The most accurate structures on the Panorama are its 35 major bridges, which are finely made of brass and shaped by a chemical milling process. The model is color coded to indicate various types of land use. The dark green areas are parks. Parkways are also edged in dark green. Mint green sections are related to transportation including train and bus terminals. The pink rectangles that dot the City show the locations of recreational areas including playgrounds and tennis and basketball courts. Clusters of red buildings are indicative of publicly subsidized housing. Red, blue, green, yellow, and white colored lights were installed on the surface of the Panorama in 1964 to identify structures housing City agencies relating to protection, education, health, recreation, commerce, welfare, and transportation. Overhead lights have been designed to run in a dawn to dusk cycle, and the nighttime effect is enhanced by ultraviolet paint, illuminated by blacklight. In 1992, the City began a renovation of the Queens Museum of Art and the Panorama. Using their original techniques, Lester Associates updated the Panorama with 60,000 changes. In the current instalation, designed by Rafael Viñoly Architects, visitors follow the course of the original “helicopter” ride on an ascending ramp that enables them to experience the Panorama of the City of New York from Multiple Perspectives.